The U.S. Jobs Deficit declined by 30,000 in July, falling from 11,790,000 in June, to 11,760,000, based on yesterday’s Employment Situation Report. While May’s number was revised upward by 10,000, and June’s number was revised downward by 16,000, the economy added a mere 163,000 jobs in July. And since we need to create 127,000 jobs a month, just to keep up with population growth, this resulted in an overall decline in the jobs deficit of 30,000 compared to the month prior (see chart below). Emboldened by the 30,000 net improvement to the jobs deficit, Barack Obama ridiculed Mitt Romney’s economic plan, stating that, ‘the idea that tax cuts would pay for themselves by way of a “massive boom in the economy” is “fairy dust” that the GOP has “tried to sell” in the past and hasn’t worked.’ But what’s ironic is that even July’s tiny increase in jobs can be attributed to nothing more than traces of fairy dust leftover from the Bush Tax Cuts of 2003. To state otherwise, would infer that allowing the Bush Tax Cuts to expire would have yielded a better result, and surely not even Obama believes that one. According to U.C. Berkley Professor and President Obama’s former Chair of his Council of Economic Advisers (CEA), Christina Romer, in a paper published in 2010, a tax increase of 1.0% of GDP, reduces output over the next three years by nearly 3.0%. I would add that a decline of 3.0% in output equates to a loss of around 12.7 million jobs. So does it take a rocket scientist to understand that a tax cut of 1.0% of GDP would have the opposite effect, increasing output over the next three years by nearly 3.0%, and adding around 12.7 million jobs? Call it voodoo, fairy dust, Reaganomics, supply-side economics or whatever you wish, but it’s really just common sense. What’s wrong with a little fairy dust? Obama’s misconception is steeped in the theory of Static Revenue Analysis, while Mitt Romney’s plan is based on Dynamic Revenue Analysis, or if you prefer “fairy dust”. Obama wants to raise taxes on the top 2% of income earners while doing absolutely, positively, nothing for the other 98% of Americans. Great plan Stan. On the other hand, Romney wants to cut personal income tax rates by 20% across-the-board on all Americans, eliminate taxes on interest, dividends and capital gains on those making less than $200,000, eliminate the death tax, eliminate the alternative minimum tax and lower the top corporate tax rate from 35% to 25%. What’s wrong with that? Under Obama’s static theory, the size of the economy, the number employed persons, personal incomes, and the amount of income tax collected are all fixed. Following are five common assumptions under his static theory. If you’re not working today, you will never work again. If you are working today and making $25,000 a year, you’ll be making $25,000 for the rest of your life. Since the official U-6 unemployment rate is currently 15.0%, it will remain so indefinitely. If taxes are cut, the rich will pay less in taxes (unproven). Because the government collected roughly $2.4 trillion in taxes last year, unless tax rates are hiked, it will collect roughly the same amount every year going forward, from exactly the same taxpayers. Thus, under static theory, the only way the government can get more money, Obama’s ultimate goal, is by raising taxes, and any reduction in tax rates would result in a permanent reduction in revenue. Under Romney’s dynamic theory, the belief is that the stimulative effect of allowing citizens to keep and spend more of their own money will result in growth in the size of the economy, the number of working persons, personal incomes and the amount of tax revenue. Following are five common assumptions under dynamic theory. If you’re not working today, you will eventually find a job and start paying income taxes. If you are already working and making $25,000, your income will eventually rise and you’ll end up paying more in taxes than you were before, albeit at a lower tax rate. The economy will reach full-employment. When taxes are cut, the rich will pay more in taxes (proven), and more people will become rich. An increase in economic output yields an increase in the number of working persons, which means more taxpayers, and thus greater government revenues. What we should understand is that supply-side economics has always worked in the past and always will in the future. In the 1980’s it was called Reaganomics, but pejoratively referred to as “trickle-down” or “voodoo” economics. Today, according to Barack Obama it’s just “fairy dust”. How original. Call it what you will, it does work, and that’s more than can be said of Obamanomics. In the 1980’s, the four pillars (i.e. fairy dust) of Reagan’s economic policy were to reduce the growth of government spending, reduce income tax and capital gains tax, reduce government regulation of economy, and control the money supply to reduce inflation. Mitt Romney’s five point plan builds on Reagan’s four pillars, his policies also cut the deficit, reduce income and capital gains taxes, reduce the number of government regulations and create a Reagan Economic Zone to strengthen free-enterprise and the U.S. Dollar world-wide. What’s wrong with that? In order to keep up with population growth, we would need to create 127,000 jobs times 29 months, or 3,683,000. Add in the need to make up for the jobs deficit and we’re at around 15,443,000 (3,683,000 + 11,760,000) over the next 29 months — or 532,517 jobs a month. In order to keep up with population growth, we would need to create 127,000 jobs times 60 months, or 7,620,000. Add in the need to make up for the jobs deficit and we’re at around 19,380,000 (7,620,000 + 11,760,000) over the next 60 months — or 323,000 jobs a month. 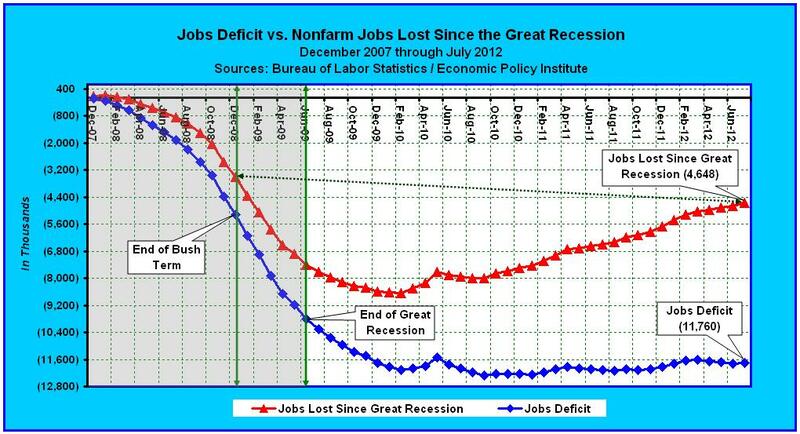 The Bottom Line: Since we only created 163,000 jobs in July, and since the jobs deficit declined by a mere 30,000, under the policies of Barack Obama, we are something in the order of 54 years away from full-employment [(323,000 / 30,000 = 10.8) and (10.8 * 5 = 54 years)]. In other words, we are NOT moving in the right direction, we aren’t moving at all. Due to a waste of 43 months under the failed policies of Barack Obama, we must now create 532,000 jobs each and every month to be on a track towards full employment within 29 months, or 323,000 jobs each and every month to be on track towards full employment within 5 years. Thus, since Obamanomics has pushed us so far away from the mark that most of us living today will never see full-employment again within our lifetimes; perhaps a little “fairy dust” is in order.